One of the most important parts of a wedding is the bride and groom's entrance, this is why couples choose a song that represents their happiness and love when entering their wedding venue. Brides consider the song they enter to or the zaffa a very important part, some brides choose a classic song while other brides want the whole zaffa band. Zaffa bands are always a great way to add some joy and fun to your wedding, and when it comes to zaffas, there are so many options, most brides and grooms choose a zaffa that comes from their backgrounds and culture, if you are a Lebanese bride and groom, there is nothing nicer than entering your wedding venue to the music of happy Lebanese zaffe tunes. So have one amazing and fun Lebanese wedding entrance and hire a Lebanese Zaffe or Lebanese wedding drums. If you are a Lebanese couple or celebrating your wedding in Lebanon, and looking for a Lebanese zaffa band, we have some of the top zaffa bands for you to choose from. Al Wazir Zaffa team offers many entertainment services such as Zaffa band, fire shows, parades, and more. Zaffet Al Sultan is a first class entertainment group providing the highest quality services to make an unforgettable memory for your special events. Zaffet Al Sultan is founded by Rawad Bou Mrad, a talented and professional wedding planner, well-known in organizing special occasions and all kind of particular events. Zaffet Al Sultan became one of the most popular and well-known entertainment groups in Lebanon and the region. By focusing on well choreographed and highly unforgettable entertainment experiences, Zaffet Al Sultan has maintained an unparalleled reputation for quality. Zaffet Al Sultan offers its clients a wide variety of shows including:Parade shows - Oriental shows - Arabian nights - Hawaïan shows - Fire shows - Acrobats - Salsa dancers - Oriental dancers- all kind of music instruments musicians and our special and unique Al Sultan Show.Our goal is to give our client a unique experience on their occasions such as Weddings, Bachelors, Birthdays, Engagement, Holy Communion, Baptism and any other special event. Your wedding day will not happen again, so make it a special one with Amjad Group, a team of specialised dancers and entertainers to make sure your wedding is a unique event. Established in 2003 Al Oumara group for entertaining has the best zaffa and entertainment for Lebanese weddings, they also offer other services such as sound & light, flower decorations, fire works, as well as ushers and waitresses. Al Ahlam Zaffe was established in 27 February 2009 by the brothers Hisham and Rudy Harb, they started off with small weddings and soon became one of the top and biggest entertainment companies in Lebanon. 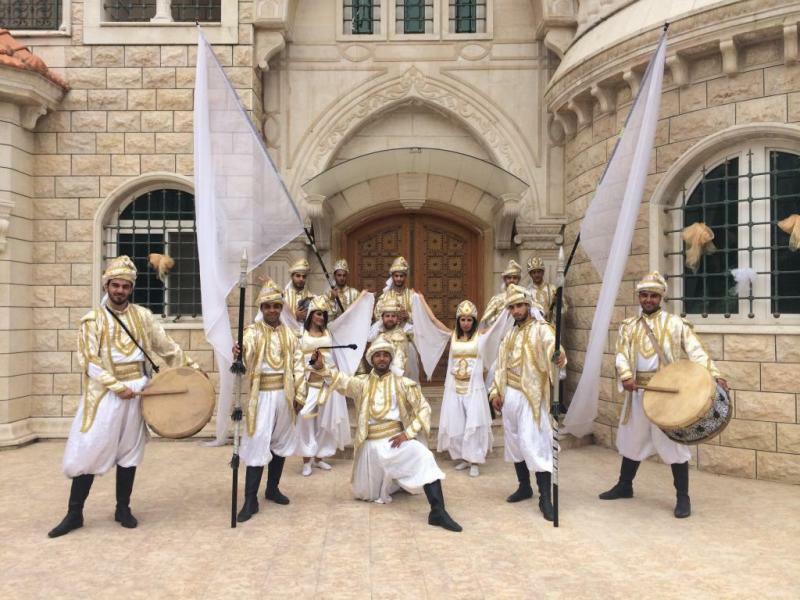 Al Mir is a dancing band of 100 professional dancers an musicians, they are experts when it comes to Lebanese zaffa, and other entertainment shows such as Oriental, Victorian, and Spanish. Zaffet Youssef Mou3akkar Group presents unique shows inspired by the Lebanese folklore and culture, from traditional Lebanese dancing, to Lebanese zaffa, and other traditional dances. If you are bored of the traditional zaffa and entertainment, K Event by Keven Azzi will create a unique performance just for you. “Kalista Group” is a Zaffeh Group that was founded by Ziad Al Batlouni and Tracy Chammas. The two partners have 14 years of experience in the events field as they were members in other companies for years. The company was created as a means of creating performing arts diversity, with attention on the field of dance. Established in 2005, Areej Group consists of amazing and professional dancers, and they have their own unique style in zaffa and entertainment.